Queensland's Sunshine Coast is a unique and varied destination where fun, nature and relaxation are the key ingredients. Families, couples, singles and international visitors alike have made the Sunshine Coast their first holiday accommodation choice for years. 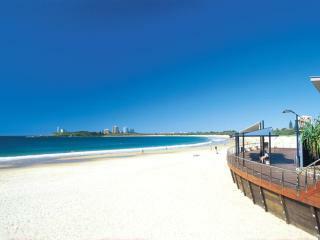 The Sunshine Coast starts around Caloundra and extends to Noosa in the north, the gateway to Fraser Island. It also extends inland to the beautiful and peaceful hinterland which includes the Blackall Range, Noosa Hinterland and the Glass House Mountains. There is something for everyone on the Sunshine Coast - stunning beaches, clear warm water, surfing, fishing and boating. The Coast is unspoilt but cosmopolitan, where five star resorts are in harmony with pristine rainforests and wetland sanctuaries. And it's all just over an hour's drive from Brisbane, Queensland's state capital and international gateway. With its glorious climate and beautiful beaches, you are pretty much guaranteed the ideal beach holiday. Sunshine Coast Accommodation is available for every kind of traveller. With one hundred kilometres of stunning beaches flowing through the seaside towns of Mooloolaba, Maroochydore, Coolum, Noosa and Alexandra Headland, the Sunshine Coast is the ideal holiday destination for couples and families. The range of accommodation options is almost endless with hotels, resorts and spa options in abundance to suit all kinds of budgets, basic to luxury. For those of you looking to relax while on the Sunshine Coast, spend the day at Noosa, shopping in the boutiques on Hastings Street, explore the Noosa National Park, or take the kids to Main Beach, a safe patrolled surf beach, perfect for families with young children. Other Sunshine Coast activities include diving with huge sharks and swimming with the seals at SEA LIFE Sunshine Coast. Cuddle a koala or see the fearless keepers feed the crocodiles at Australia Zoo. Spend the day tickling your tastebuds at the many restaurants and cafes that line the Esplanade of Mooloolaba, or enjoy a coffee and wander through the streets of Maleny and Montville. Sunshine Coast weather is possibly the best in Australia or even the world. Winters are mild and summer is provided with cool sea breezes. The Sunshine Coast certainly earns it's name with there being plenty of sunshine all year round. 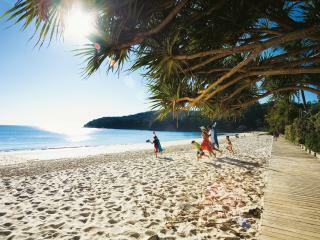 TravelOnline have a number of Sunshine Coast packages. Holiday packages often include additional items at discounted rates to give you even better value for money. The components of holiday packages often include options such as accommodation, meals, transfers, insurance or flights. TravelOnline allows you to get instant quotes from our site and also have experienced travel consultants on hand to assist with your booking and enquiries. A distinctive feature of the Sunshine Coast is the Glass House Mountains named by Captain Cook in 1770. The region was popular with runaway convicts in early white settlement history and later developed a thriving timber industry. Gold prospecting is also a big part of the region's history.